When I first put together the Monterey auction preview for next weekend's sales, Mecum hadn't yet uploaded photographs for this particular Porsche 959 lot. I'd thought to myself that the pricing seemed a bit on the low end of 959 values with a pre-auction estimate around the $500 grand mark, particularly as most of them have climbed above the million dollar price these days. But, being that the lot description didn't mention anything out of the ordinary, and discussed the 959's low-mileage beauty, I figured that it was simply a case of Mecum being a bit out of touch with the Porsche market. Now that they've finished the photo shoot of the Porsche and uploaded those pictures to the lot's description, the price seems to have reversed and now feels like too much for what you're getting. The 959 was a technological tour de force for Porsche and held the lofty honor of being the world’s fastest street-legal production car in 1986. Boasting a 0-60 MPH time of 3.6 seconds and a factory-rated top speed of 197 MPH, the 959 served notice that above all other cars it was the ultimate definition of speed. This uber-Porsche also delivered comfort and composure to match its blistering performance, making it the ultimate supercar of its era. The 959 featured cutting-edge technology and marked Porsche’s landmark first foray into all-wheel-drive, twin sequential turbocharging, anti-lock brakes and lightweight composite bodywork. Porsche understood that all-wheel-drive could serve to drastically improve handling by distributing power to each of the four wheels and help mitigate the incumbent oversteer tendencies characteristic of the rear-weight-biased 911. Using a detuned version of the unfettered 962 racing engine, Porsche introduced twin sequential turbocharging to realize a smoother and progressive power delivery than what was the norm for turbocharged engines of the time. With an engine displacement of just 2.85L, this technological marvel was able to produce a robust 444 HP. In order to achieve both improved strength and weight reduction, Porsche used alternative materials such as Kevlar and Nomex throughout the machine. The cutting-edge technology in the 959 incrementally made its way into later generations of Porsche. All-wheel-drive came into being with the 1990 model-year 911 Carrera 4, twin sequential turbocharging was first featured on the Type 993, and composite bodywork/Kevlar technology was used on both the Carrera GT and 918 Spyder. The 959 convincingly demonstrated the viability of the basic 911 architecture—body silhouette and rear engine placement—as a suitable platform for supercar performance. Although it was originally restricted from import into the United States, the 959 can now be tuned for EPA compliance. With only 3,657 actual miles and one of only 294 examples built in the Komfort specification, this 959 is an example of Porsche’s iconic 1980s supercar. The good news is that all of this damage looks somewhat reasonably repairable. Once you've got the Porsches's front trunk pan and the area behind the front bumper straightened out again, it's just a matter of finding replacement cosmetic parts. 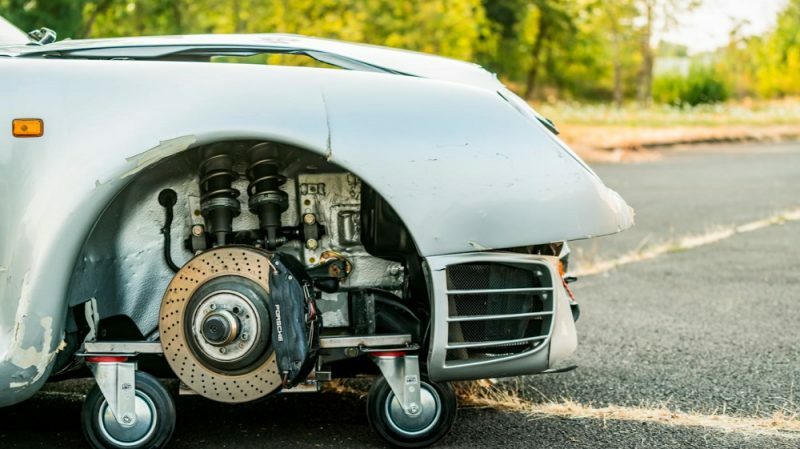 A bumper and a pair of fenders aren't going to be easy to find for this 959, but there are certainly harder things in life. And at the end of the day, it's worth it to put such a historically significant car back on the road. If I had the spare half-million necessary to bring this thing home, my first call would be to Bruce Canepa. Hey Bradley, your first call would be to Bruce Canepa??? Your a MORON. Canepa is a CON-MAN and a crook!!!. Can’t Flatsixes find people to write about cars that have any clues about the automotive world?? So You’ll put your name to that claim?! I can then give it with your name to Bruce next time I’m there. IIRC a 959 in far worse condition than that was auctioned in the UK and subsequently restored. Apparently it took off over a hump back bridge and then barrel rolled – whilst on a test drive! You broke it, you bought it?! 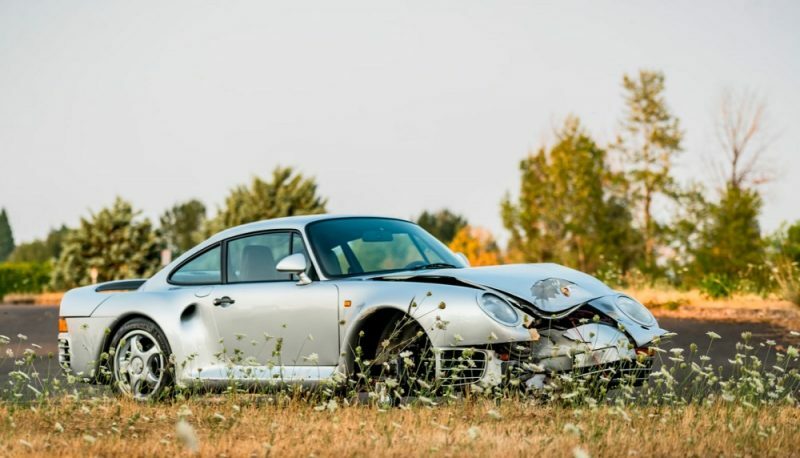 Someone will repair it and it should be repaired, it is one of Porsche’s not so pretty cars but a significant one that they have produced, something like only a mother’s love for a child would.